Most people don’t like waiting. It's a necessary nuisance. But, it doesn’t have to be. Waiting Rooms are a site-specific installation which adds a positive vibe to the whole experience. Brightly coloured steel structures are shaped into forms echoing houses. The effect is immediate. Placed on urban roadsides, the minimal structures create intimate areas in the open air, stimulating interaction between people. Strangers strike up conversations and children clamber along the frame. 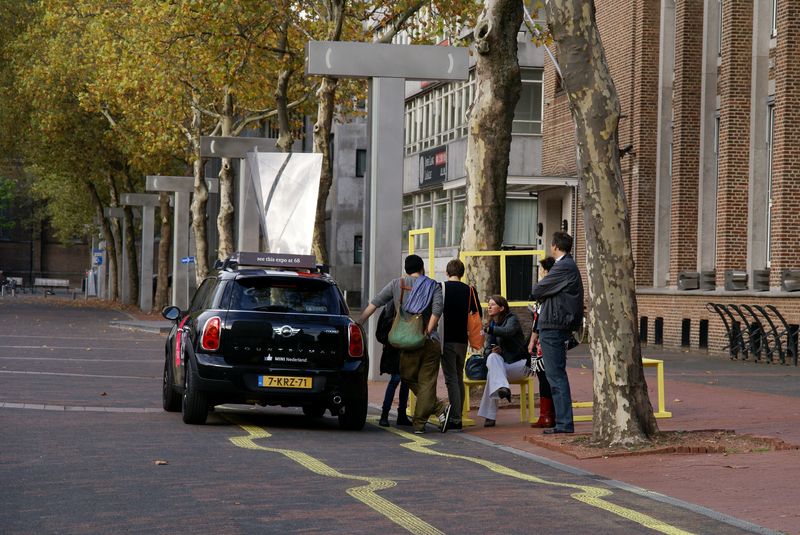 Waiting Rooms are designed as temporary taxi stops for MINI Design Rides during Dutch Design Week to shuttle visitors across the city. Tire tracks of coloured paint show people where to go. Upon closer inspection, the pattern in the tracks spells out the word MINI; a clever way of communicating the brand sponsoring these special taxis.